It’s been over two weeks since we last had a day off to go walking….on that occasion, a wander up Glen Rosa over on the Isle of Arran. Since then there seems to have been a continuous stream of gales racing in off the Atlantic There have been a couple of quiet and fine days in between but one or both of us have been working! This last week has been another busy one and with Nita working this weekend it looked like we wouldn’t get out for a walk until next week at the earliest. Earlier I’d spent quite a bit of time getting images and text ready for the invitation cards for my exhibition, two new business post cards, and four new greetings cards. For a number of years I’ve been asked by Steve and Sylvia up at Blairmore Gallery, if I’d have a few greetings cards made for sale at their gallery. I’d never really got around to looking into it until now but as I had to go to our local printer for the new business cards I thought I might as well ask. In short, not only could they print the greetings cards, they could also supply them with envelopes and packed in clear cellophane bags. I’ve decided to have four different cards printed and have ordered 100 of each. This will allow me to pass some onto the Blairmore Gallery, have some for the forthcoming exhibition in Edinburgh and also have them for sale at my studio and possibly on-line through my website too. Anyway, as you can imagine, all this took quite a lot of time …probably the reason I’d put off doing it previously if I’m honest. I got the proofs back from Kestrel Press on Thursday and they look quite good I think ….so have given the go ahead and am now waiting to see what the actual things look like when they’re printed and packaged. Exciting stuff! As I said, I got the 8 different digital prints back on Thursday and I’m pleased with the majority of them. A couple haven’t quite come out as I’d hoped but the other six look great and I’ll be taking two copies each down to my framer to get them mounted ready for the exhibition. Like the greetings cards, this is all rather new and so will be a learning process for me. It’ll be interesting to see if I’ve made the correct selection of images for the prints and cards….whether the more abstract images are as popular as the others. I’ve now almost decided on the 17 pieces to be included in my exhibition …although to be honest my choice has changed several times already! I’ve got four paintings waiting at the framers to be collected so once they are back and I have all the work in the studio it should be easier to decide. One of the big questions is whether to have two of my new A2 drawings framed and on the wall …instead of two of the paintings. I had planned just to get the drawings mounted and displayed in a stand. Ahhhhhh …still can’t decide! With all this on the go, it was a great pleasure to hear my partner suggest that we take advantage of a dry day on Friday to get away from it and out into the hills for a few hours. 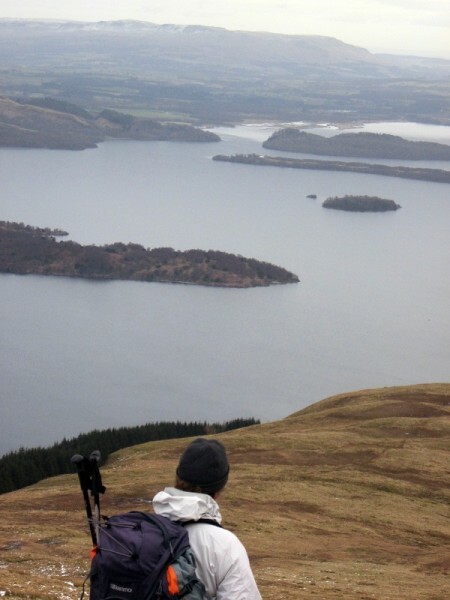 As you know, we like the Luss Hills and they are about the closest to get to from Irvine. They’re steep but not very high so they make an excellent work-out even though you can still have quite a short day. This was just what we needed. With Nita working 12.5 hour shifts today and Sunday, she didn’t want a long drive or a too exhausting walk. 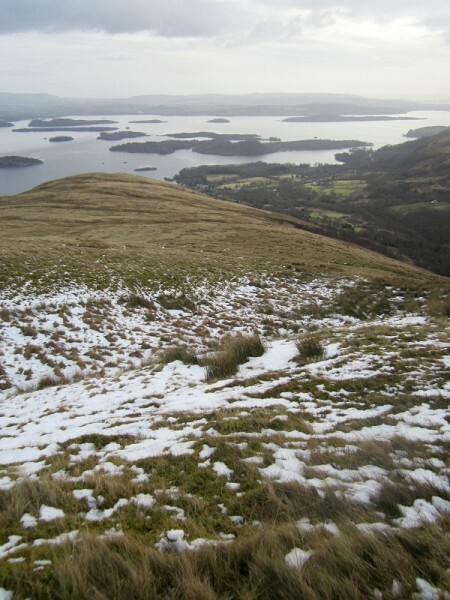 We’re regulars to Beinn Dubh and Mid Hill but the views out over Loch Lomond and the surrounding hills of the southern Highlands are just so good you can keep on going back time after time. 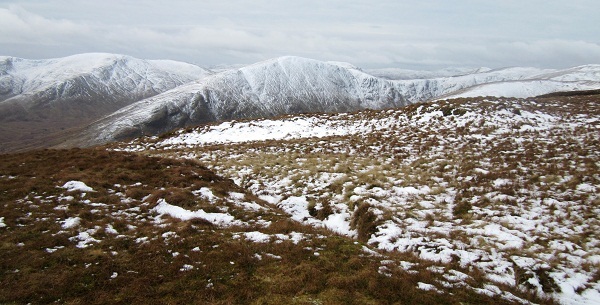 Yesterday there was a little snow higher up which made everything look extra special and we had a slow haul up to the top, avoiding much of the path so that we could get better views into Glen Luss. This also had the advantage of keeping off of the increasingly frozen and quite slippery path. 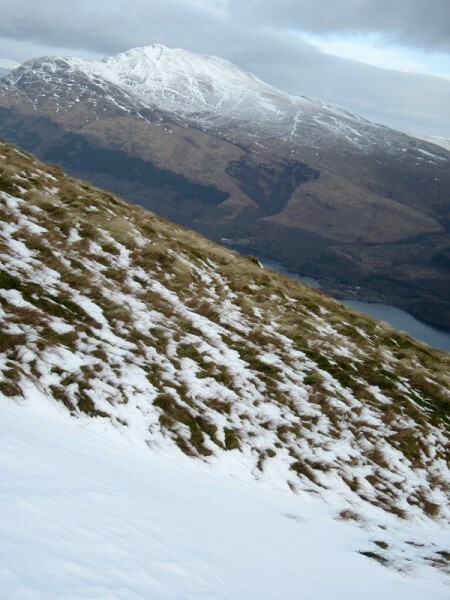 Higher up though we were back to the path and I came a cropper ….slipping on some ice hidden under some powdery snow. I landed rather heavily on my backside but thankfully I was just shaken …nothing more. I should have stopped to put on my ‘spiders’ earlier but had planned to do that at the top so that I had them for the more difficult descent. What a prat …I should have known better after all these years. There we are, no real harm done. except perhaps to my confidence and pride! Back out again next week if we can catch another good day.